It can be hard to get kids excited about learning. That why sometimes it is a good idea to teach kids using fun activities that they’re already interest in. That’s why National STEM Day is a great day to take your kids roller skating in Odenton! National STEM Day, held annually on November 8th, was created to help teach children about science, technology, engineering, and mathematics (commonly referred to as STEM fields). You see, many of the fastest growing occupations in the United States are STEM careers. This means that fostering a love of and interest in STEM fields can give your children a huge advantage in life. Unfortunately, the US’s STEM education is falling behind compared to that of other industrialized countries. Globally, US students rank roughly in the middle based on our children’s science, math, and reading scores. Teaching STEM with roller skating is a perfect way to get your kids excited about learning. Physics in roller skating is very important. Friction, acceleration, velocity, inertia, and centrifugal force are all vital components of roller skating. Accelerating, stopping, and moving are all only possible on roller skates because of physics. This makes roller skating a wonderful opportunity to teach your children about the importance of STEM. So check out our hours and make your plans to visit our Odenton skating center in observance of National STEM Day. You and your family will get some great exercise, have tons of fun, and you will be helping foster a love of STEM fields in your kids! Get Ready for National Roller Skating Month! Wondering what National Roller Skating Month is all about? National Roller Skating Month is held every October in order to promote the sport of skating, connect people with their friendly local skating center, and get more people to enjoy the fun and health benefits of skating! Skating is an outstanding way to get in shape. 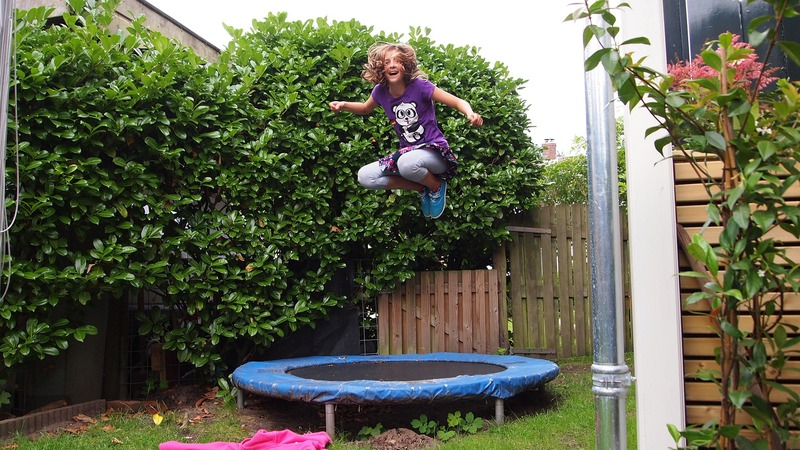 As a low impact exercise, it’s perfect for young kids and most older adults as well! Teaching your kids to skate is a great way to foster the habits that will lead to a lifetime of fitness. Skating is also a great exercise because rink skating is perfect for rainy days and cold weather! And of course, skating is social, fun, and family friendly. So how can you and your family celebrate National Rolling Skating Month? It’s simple! Come to Wheels Skate Center for one of our open skating sessions or book a party today! You can also take advantage of one (or more!) of our many weekly Odenton events. 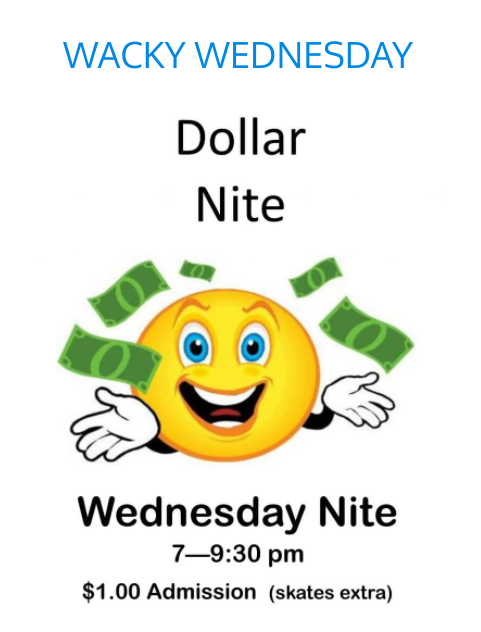 We offer an Adult Nite every Tuesday and a family-friendly Dollar Nite on Wednesdays. If you have young children ages 10 or under, our Saturday Morning Kids Fun Time is perfect! Don’t worry if you or your children don’t know how to skate – we have a Beginner Skate Class every Tuesday from 6:00-7:00 pm. This is an all ages, drop-in class. Admission is only $5.00 and each class includes a quad skate rental. It’s a great (and inexpensive) way to learn to skate. Are you looking for a cool, fun new way to keep your kids busy before and after school? At Wheels Skate Center in Odenton, MD, we now offer school-age child care! Skating is fun, affordable and so good for you, so it was only a matter of time before it became a child care craze. The child care program at Wheels allows your children to stay physically active, make new friends, and learn every single day before and after school! Check out some of the program details below and give us a call to find out more. We offer two separate programs here at Wheels. Our morning program starts at 6:15 am and will provide transportation to school from our skating center. The morning program is available every weekday for only $50 per week. Our after-school program is $150 per week and includes skating, homework time, snacks, and more! Our after-school program runs until 6:15 pm every weekday. You can also sign up for both morning and after-school programs for only $125 per week! Sign up your kids for before and after-school care in Odenton. Want to learn more? Give us a call today at 410-674-9661! Have Fun and Save Money with Our Weekly Specials! Raising kids can be expensive, but that doesn’t mean that you and your family can’t have a little fun. 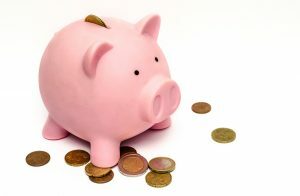 With a little planning and some frugal living tips, you can still have a ball with your family. Beginner Skate Lessons – Each Tuesday, we offer beginner skate lessons from 6:00-7:00 pm. This is a great way to teach your children to skate and admission is only $5! Adult Skate – Family-fun is important, but don’t forget to make time for yourself. Each Tuesday Night we offer adult skate (21 and up only) from 7:30-9:30 pm. It makes a great date night or moms’ or dads’ night out! Admission is only $5. 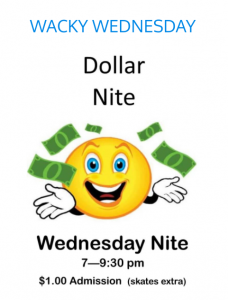 Dollar Night – Each Wednesday night from 7:00-9:30 pm, we have a special dollar skate night. Admission is only $1 (this does not include rental, but you can bring your own skates). Kid’s Fun Time – Each Saturday from 11:00 am-12:30 pm is Kid’s Fun Time! This special morning skate session is for kids 10 & younger (plus their parents) and includes a free 15-minute balance skate lesson. Admission is $5 and skate rentals are included. Family Skate – Every Saturday night we offer free admission for Mom and Dad with a paid child admission. Admission is only $8, and skating runs from 8:00-11:00 pm. So make your plans for a little Odenton family fun today! And don’t forget to follow us on Facebook to stay up to date on our all our specials and our special events! Ready to Roll on Your Own Skates? If you love skating as much as us, you’ve probably considered buying your own skates. If you’re still on the fence, check out the pros and cons of buying skates below. Renting is a great way to try out quad skates and inlines without needing to make a costly investment. When you rent from us, you don’t have to clean, maintain, or store your skates. If you’re considering getting skates for your children, renting is a great option so that they don’t outgrow their skates as fast as you can buy them! Of course, when you rent, you’ll be more limited by what’s available, and you’ll have to pay each time you use them. If you skate a lot, buying your own pair of quads or inline skates might be right for you. When you buy from our Pro Shop you can get the exact size, look, and features you want. This freedom is great for more seasoned skaters looking for more precision and customization. The major downside of renting is that buying might be more expensive than renting (depending on how much you skate). There is also a time and cost commitment to maintaining your own pair of skates. Do you think the rewards of skate ownership are right for you? Then come visit our Pro Shop! 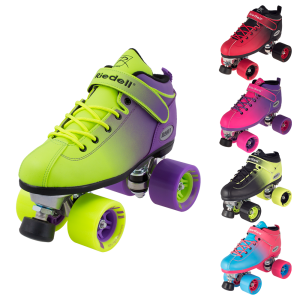 We carry a ton of skates and skating accessories for sale, including many from Riedell and Southeastern Skate Supply. When you visit our Pro Shop, we’ll help you with fit and sizing. Plus, you can check out the many different styles and features available. And if you don’t find exactly what you are looking for, we’re always more than happy to order what you need! Summer’s not over just yet and at Wheels Skate Center in Odenton, MD, we’ve still got some serious summer camp fun going on! Don’t let all those back-to-school commercials get you down. There’s plenty of time left to get your skate on. 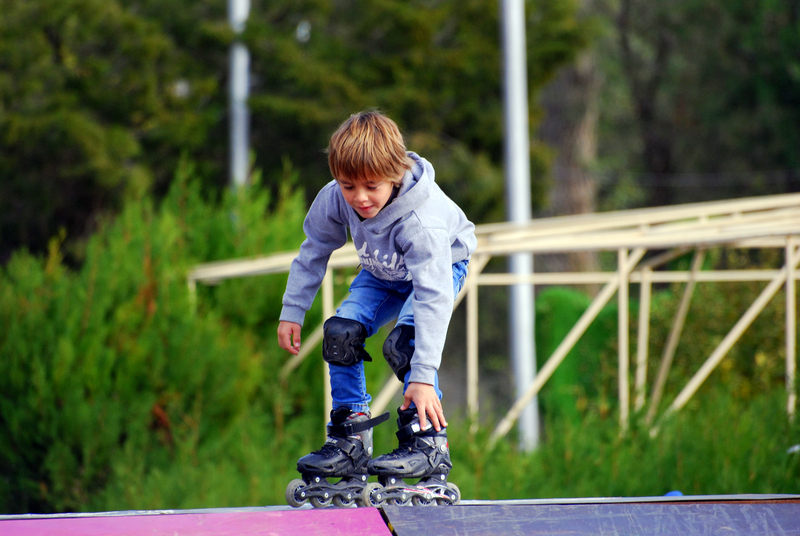 Are your little ones ready to skate the rest of summer away? At Wheels Skate Center, our summer camp is still going strong. Take advantage of our summer camp deals from now through Friday, August 31st. We’re offering summer camp Monday through Friday for three more weeks! 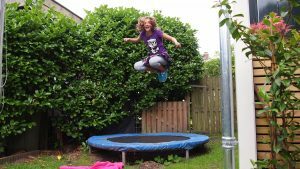 Check out the different options and figure out what works best for your kids while summer is still here. We are offering skate camp from noon until 3 pm every weekday until the last week of August. For just $5 your little skaters will get three hours of rink time with skate rentals included. We also offer all-day camp from 7 am to 6 pm for just $25 a day. That includes skate rentals, breakfast, afternoon snacks, and activities all day long! But parents, remember that you need to pre-sign for the all-day skate. 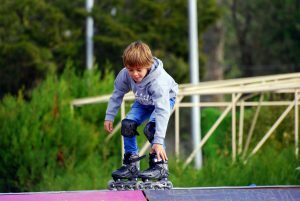 Skating isn’t just a blast for kids of all ages, it’s also a great way to help the little ones stay in shape while school is out. Skating can burn up to 600 calories an hour and coming to our summer camp even twice a week will keep your kids in great shape all summer long! Plus skating improves balance, increases stamina and is a great way to make new friends. Seems like a no-brainer to us! Drop by and make the rest of this summer break something to remember. Since summer gets so hot, summer birthdays are often hosted at the pool. While pool parties are always fun, they get a bit repetitive. So, why don’t you change up the birthday party venue? 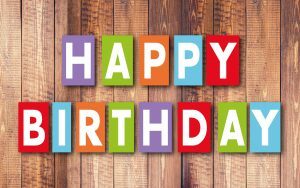 We suggest booking a birthday party at Wheels Skate Center. Your birthday girl will love the environment, fun music, and flashy lights. And, we know you’ll love our unbeatable prices connected to our birthday party packages! A great way to get your child hyped about her birthday is for her to help you make the invitations! You can ask her to decorate the outside of the invitation; or, if she’s old enough, she can fill out all of the information. You can also teach her how to address an envelope and where to correctly place a stamp! One of the best ways to get your child excited for her birthday party is to make small gestures leading up to the party. So, for the week leading up to her birthday, do something sweet once a day. Here are a few examples: make a kid-friendly breakfast, take her to her favorite ice cream shop, decorate her room with balloons, bake a cake together, and make her favorite home-cooked meal. If you’re ready to book your child’s birthday party at Wheels Skate Center, contact us today! We can’t wait to celebrate your birthday girl! Kids are used to being around other kids their age eight hours a day, 180 days a year. So, when summer rolls around, they may easily get bored or quickly start picking on their siblings. Fortunately, there are plenty of things to do in the summer! That’s why the team at Wheels Skate Center has put together an A-Z list of things to do that will keep them active and occupied. Pick your favorites or try them all! Some of these activities may take days, and other activities may take a few minutes. But, one activity you can be sure will give them hours of endless fun is time spent at Wheels Skate Center! Let them invite their friends to the rink and watch the fun unfold. Check out our hours. We can’t wait to see you soon! You can skate anywhere you’d like on the roller skating rink. But, most skaters who want to practice their tricks and dance moves do so in the middle of the rink. Skaters who want to race around the rink or just glide with ease do so near the rink’s edges. Whether you’re trying new roller skating tricks or speeding around the rink, it’s important not to stop on the rink itself. If you do, you become an obstacle that other skaters must go around. If you need to take a break, tighten your laces, or just need to stop, hop off the rink. Collisions occur when skaters get too close. To prevent this painful occurrence, give the skaters around you plenty of space. If you do accidentally trip and fall, pull your fingers and arms in close so they don’t get squished by roller skates. Get up as quickly as possible to prevent an injury. At Wheels Skate Center, we have upbeat music, an enthusiastic ambiance, delicious snacks, and much more. So, enjoy this time with your friends! Your good attitude will be contagious and everyone around you will have a blast. Now that you know roller skating etiquette tips, head to Wheels Skate Center! 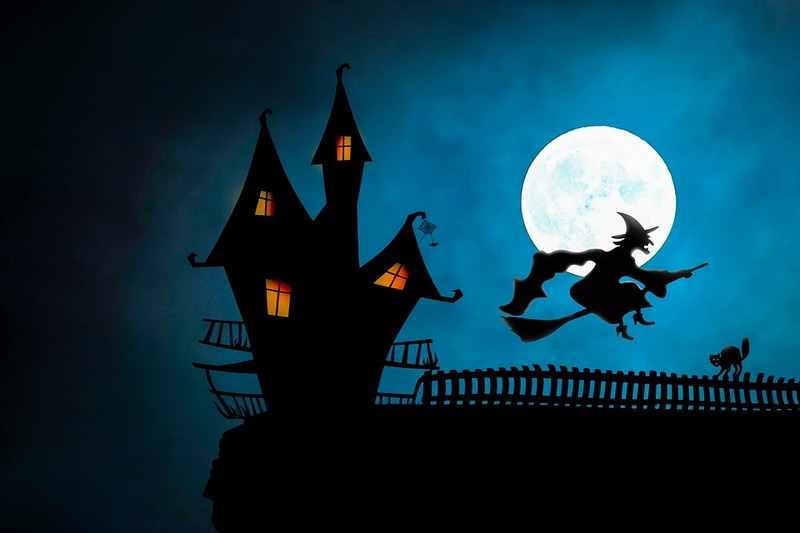 Check out our schedule, and enjoy hours of endless fun.